The 4th Congressional District is centered in California’s gold country along the Sierra Nevada foothills. It's a storied area — the gold rush sparked the largest mass migration in U.S. history — and is one of the state's most conservative districts. It has the highest share of registered Republicans in California. And while the chances of flipping it from red to blue remain small, Democratic newcomer Jessica Morse has managed to raise more than $1.4 million since she entered the race last summer, bolstering support through her lengthy background in national security. 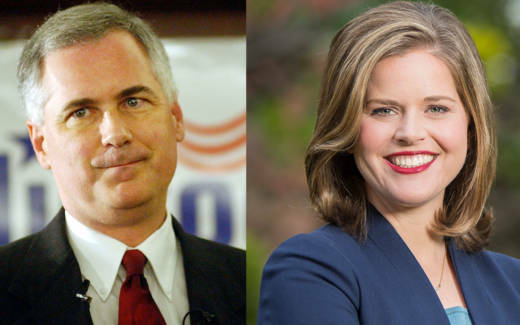 Morse is challenging Republican incumbent Tom McClintock, who is seeking a fifth term; he's won reelection with more than 60 percent of the vote in recent years. This morning on KQED’s Forum program the two tangled on several issues, including the passage of the Republican tax reform package, which McClintock supported. But Morse countered that McClintock was overstating the benefits of the tax cut. McClintock countered these figures explaining that the CBO number was a projection that has turned out to be wrong. "In the first 11 months of this fiscal year we're bringing in more revenues to the federal treasury with the tax cuts than we had taken in last year without them," he said. The Congressman also doubled down on another controversial issue — putting armed guards in schools to help prevent mass shootings. "What I find appalling is, you walk into any bank and you'll see an armed guard there. But you don't think anything of it. That armed guard is there to protect our money," McClintock said. "And yet when it's suggested that we should have armed guards on our campuses to assure the safety of our children, the left goes absolutely ballistic." McClintock also said teachers who have concealed carry permits should be allowed to carry their guns on school campuses. But Morse argued that this was an overly simplistic argument and the presence of guns on campus is not a realistic solution. "They [teachers] haven't gone through that level of training that our actual officials go through to be able to be responsible with a gun if there's a real safety situation," Morse said. "We need to have effective policies and I think that means ensuring that the safety standards we already have here in California are broad across the country." McClintock said gun control laws have only proven effective at disarming law-abiding citizens. Weighing in on the most recent and heated political topic — Brett Kavanaugh's confirmation to the Supreme Court — McClintock said the decision was "momentous and joyous for the constitution” as Dr. Christine Blasey Ford leveled an accusation against Kavanaugh without evidence. Morse insisted that rather than taking aim at survivors, we should instead be taking aim at the system, a system that Morse believes McClintock perpetuates. The candidates finished the debate with a discussion on healthcare. Morse argued for more transparency while McClintock insisted that patients need to be "back in charge of their health plans." He strongly opposes the "one size fits all" plan for Americans laid out by Obamacare. Listen to the entire debate right here on Forum.